On June 15, 2016, SAP announced SAP Business One 9.2, both on MS SQL and SAP HANA databases, exited the Early Adopter Care Program and is now in general availability. I believe GA version started with SAP 9.2 PL3. What Can You Expect in SAP Business One 9.2? Differentiation against competitors leveraging SAP HANA based innovations such as Intelligent Forecast. Browser Access for SAP Business One daily operation users. Enhanced business functionalities such as project management and improvements to existing business processes. A new Argentina localization to capture new market opportunities. Simplified infrastructure & landscape, making SAP Business One 9.2 easier and more cost effective to use than ever before. 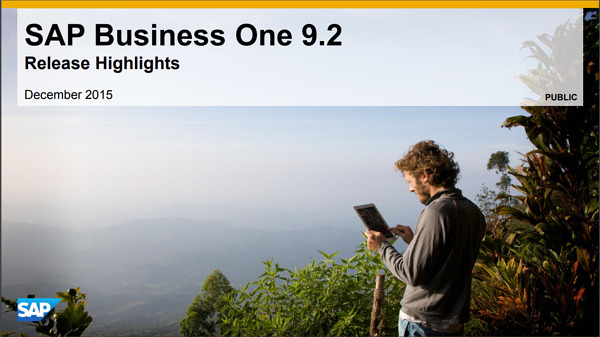 Here is video playlist, you can find the details of what is new in SAP Business One 9.2.